The region’s housing affordability crisis has put more than one million households at risk of being displaced from their homes. Cities and states must be more proactive in protecting economically vulnerable residents who have few options for affordable housing due to increasing housing costs. Policies to generate more permanently affordable and resident-controlled housing can increase wealth in lower-income communities. More supportive housing and better public housing, rent regulations, and legal aid for low-income renters would help protect people from unreasonable housing cost increases, displacement, and homelessness. Together, these policies would allow diverse, mixed-income communities to thrive. In the metropolitan region, more than one million low- to moderate-income households are vulnerable to displacement. Most at risk are residents of pedestrian-friendly urban communities with good access to jobs and services. As demand for homes in cities like New York, Jersey City, and Stamford push rents and sale prices upward, lower-income households are pushed outward. Even in cities with weaker housing markets—like Trenton and Newburgh—where many live in substandard or even unhealthy homes, new investment is sometimes resisted by residents who fear gentrification and eventual displacement. Finding and keeping a place with affordable rent is a constant anxiety. It's hard to take risks when you're always worried about where you'll be living. The result is low- to moderate-income households, 70 percent of them black or Hispanic, are at risk from displacement. The current situation is largely the result of discriminatory policies over decades, such as unequal access to financing, restrictive covenants, and redlining that prohibited people of color from living in the region’s new and desirable communities in the suburbs. Black and Hispanic families were largely confined to many of the urban areas that today are experiencing growth and reinvestment, and were also often prevented from owning homes and building equity and stability, thus making them vulnerable to the shifting forces of the housing market. There is a clear link between increasing rents, displacement, and homelessness. In New York City, a 5 percent rent increase has been associated with an additional 3,000 residents becoming homeless. The number of people experiencing homelessness in New York City—over 60,000—is among the highest in the country, having tripled over the last 20 years. I know that the neighborhood that I live in now is going through a transformation. But I think that for me, it's a double-edge sword. In one way, I am kind of happy that it's going through the changes, and in the other hand, I feel sad because a lot of the low-income families, they have no choice but to move out. Ending the region’s affordability crisis will ultimately require creating enough homes for all income levels. But a robust housing-construction strategy will take many years to achieve and could potentially increase rents in particular neighborhoods. To stabilize communities, we must preserve existing affordable housing, strengthen tenant and rent protections, and enable existing residents to capture more of the wealth created from rising property values. Community land trusts and limited-equity cooperatives are effective tools for producing healthy, affordable homes and stable neighborhoods. The Dudley Street Housing Development in Boston and the Cooper Square Mutual Housing Association in Manhattan are two successful examples of such shared-equity ownership structures. Municipalities at risk of rapid neighborhood change should conduct an inventory of publicly owned land and transfer the underused parcels to shared-equity ownership models, including community land trusts, community-owned limited equity cooperatives, community development corporations, and mutual housing associations. When ownership opportunities are being created for lower-income residents, they should be accompanied by technical assistance from the municipality. Collective ownership of housing provides an alternative to conventional home ownership and limits price increases due to speculation by making housing less of a commodity and taking profit out of the equation. Furthermore, by dividing the rights to the property between the homeowner and the community at large, shared-equity ownership models give households access to affordable home ownership and the ability to build wealth through real estate. Community land trusts and limited-equity cooperatives also give communities—via a nonprofit steward—the ability to retain a long-term financial stake in the land, maintaining permanent affordability through land leases and deed restrictions that require it, and mitigating speculative market forces. Public housing and other government-owned or controlled housing provide a stable source of permanent and deeply affordable homes for more than half a million people in the region. These homes are not only the best housing available for many of the region’s poorest residents, they support complete communities with a range of incomes, backgrounds, jobs, and skills. In many neighborhoods, public housing is often the only option for truly affordable housing. But this essential part of the region’s housing market is at serious risk. Public housing authorities have been severely underfunded for decades, with declining support from both federal and state sources. Today, the region’s public housing faces a capital budget shortfall of over $20 billion. The federal government, all three state governments, and their municipalities must recognize the lack of adequate public housing as a critical public infrastructure issue. They should dramatically increase the maintenance budgets for these valuable assets, and invest in the upgrades needed to raise public housing to modern standards and improve resilience to climate change. Rent regulation is the most effective policy to mitigate unexpected increases in rents, especially for low-income residents, many of whom are unable to obtain housing stability through other means. New Jersey and New York are two of only four states in the U.S. where at least some localities are able to regulate and limit rent increases. While some jurisdictions—most notably New York City, through its rent stabilization system—take advantage of this, many do not: Only 38 municipalities in New York and 90 municipalities in New Jersey have some form of rent regulations. States should be more proactive in strengthening—or in the case of Connecticut, enabling—rent regulations at the municipal level to cover all municipalities where displacement is a concern. These should include some limits on the amount, frequency, and timing of rent increases. They should also allow for the right to a renewal lease, require minimum services for tenants, limit the grounds under which tenants can be evicted to nonpayment of rent or violation of an existing lease, and protect tenants from harassment, as New York City has done. At minimum, rental properties that receive any government subsidy should automatically be subject to rent regulations. Strict enforcement of the housing maintenance code should accompany rent regulations in order to prevent landlords from displacing low-income tenants through lack of upkeep and proper maintenance. And when fines are not effective, municipalities should conduct the repairs proactively, with a foreclosable lien filed against the property. Funding for enforcement of the rent regulations and housing maintenance code is also critical. Approximately 400,000 eviction actions take place each year southern New York State and central/northern New Jersey counties, with more than three-fourths in New York City and New Jersey’s Essex, Hudson, and Middlesex counties. Even when tenants win in court, legal fees and lost wages from attending court often create a downward financial spiral, leading to more financial struggle, evictions, and often, homelessness. Cities and counties, with state support, should provide free legal counsel to all economically vulnerable residents facing eviction. The cost of providing counsel would be at least partly offset by future savings from preventing homelessness and associated shelter costs, and from not needing to replace affordable housing that may be lost when a tenant is evicted. Free legal counsel would also help to enforce anti-harassment policies, such as those passed in New York City in 2017, and prevent landlords from coercing tenants into leaving their home due to negligence or intimidation. 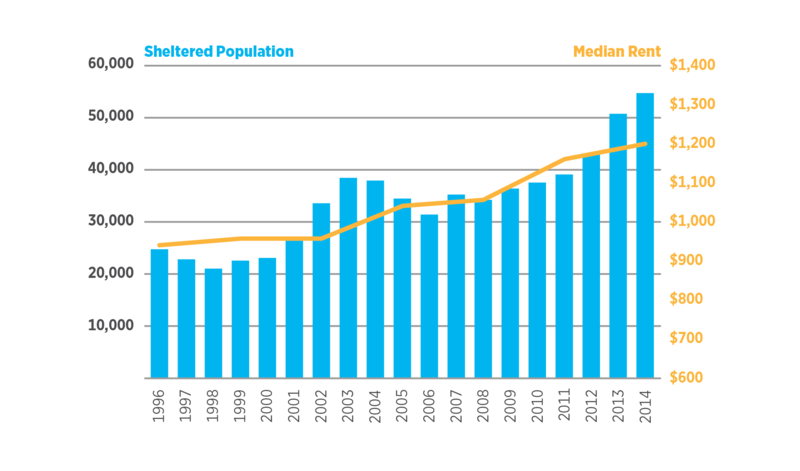 Homelessness in New York City has tripled over the last 20 years. On a per-capita basis, it trails only Washington D.C. and Boston among major U.S. cities. But other parts of the region have made great progress in reducing, or even ending, homelessness. In 2017, Bergen County, NJ, became the first in the nation to end chronic homelessness, and the state of Connecticut has the lowest number of people experiencing homelessness on record. We can end homelessness in the region with the right level of commitment and funding. Although the magnitude of the problem in New York City makes it more challenging, the following strategies can apply to the entire region. The leading causes of homelessness in both New York and New Jersey is eviction due to rising housing costs, overcrowding, and loss of a job., The most important intervention cities can take, therefore, is to prevent evictions, especially among working-poor households, and provide immediate help and rehousing when they do. Instituting better rent protections, providing free legal counsel to families facing eviction in court, and directing subsidies and housing assistance programs to low-income families who need it most are three strategies that could both help prevent people from losing their homes, and rapidly rehouse those who do. They agree on three core values, modeled after the federal Opening Doors plan to end homelessness. Homelessness is unacceptable because it is solvable and preventable. There are no “homeless people,” rather there are people who have lost their homes who deserve to be treated with dignity and respect. Homelessness is expensive for governments, and it is much more cost effective to invest in preventative and long-term solutions. Supportive housing, which combines deeply affordable housing with individualized social services to help support resident health and well-being should be provided to individuals and families who are coping with mental illness, trauma/abuse, substance abuse, chronic illness including HIV/AIDS, or otherwise may need additional support. Supportive housing programs significantly reduce the need for emergency medical services, police, jails, homeless shelters, and other publicly funded services. New York State has made progress on this front, building more than 50,000 units of supportive housing and recently committed to building another 35,000—but more is needed. All three states should expand or institute long-term agreements on funding and siting for supportive housing units, and should codify these into housing-agency budgets. Municipalities should adopt the “housing first” approach, which prioritizes providing people with permanent housing. They just built an apartment complex and knocked down an old one that wasn't gorgeous but people could afford to live there. And now, prices are absurd. These actions will help maintain the current number of existing affordable housing units, which is the first priority in reducing displacement and homelessness. Creating more collectively owned and controlled, permanently affordable housing would provide an important source of housing at a much lower long-term cost to the public, while also generating wealth in low-income communities. Strengthened rent regulation would stabilize a significant percentage of the region’s housing stock and help low- to middle-income renters manage their finances. Free legal counsel would protect those facing evictions due to price escalation, and promote income and racial diversity. Expanding supportive housing would result in higher-quality housing conditions, especially for the region’s most vulnerable residents. Treating public housing as public infrastructure with sufficient funds for upgrades and proper maintenance would help preserve existing, deeply affordable housing. The actions with the highest direct public costs would be investments to maintain public housing and expand supportive housing. In New York City alone, the cost of returning the public housing stock to a state of good repair is estimated to be $17 billion, and the annual cost of managing and maintaining it at least $2.2 billion. Consistent with funding streams for other needed public infrastructure, federal funding should remain the largest source of revenue for public housing—and it is imperative that the region’s congressional representatives continue working to reverse the trend of declining federal support. States and cities will need to provide new revenue as well. New York City, for instance, is evaluating parking lots and other housing-authority property for mixed-use, mixed-income development that could both generate revenue to fix and maintain existing public housing and bring needed affordable housing, new jobs, and other services. The cost of expanded supportive housing would also be high, but would better serve this population while offsetting many other more expensive public services. Creating permanent affordable housing on government land could be accomplished at a relatively low cost in places where local, county, or state governments own significant assets. But it would be higher in places where local governments and community organizations need to acquire public land, and where housing market demand is strong. The most cost-effective strategies should focus on neighborhoods where trusts can be established before prices escalate. The cost of expanding rent regulation could range from very low (administrative costs of the expanded regulation plus enforcement) to moderate depending on structure (e.g., more expensive if additional subsidies are provided for new rent regulated apartments). Housing agencies will also need additional funding for enforcement. The main trade-off is rent regulation reduces turnover, making it more difficult to find an available apartment, and can subsidize higher-income residents; however, well-structured regulations can minimize these effects. Free legal counsel could be fiscally neutral or positive when accounting for savings incurred from other government costs related to eviction, especially emergency shelter costs. In New York City, studies of the costs of providing free legal counsel for evictions have estimated municipal budget impacts from a $320 million surplus to a $203 million deficit.